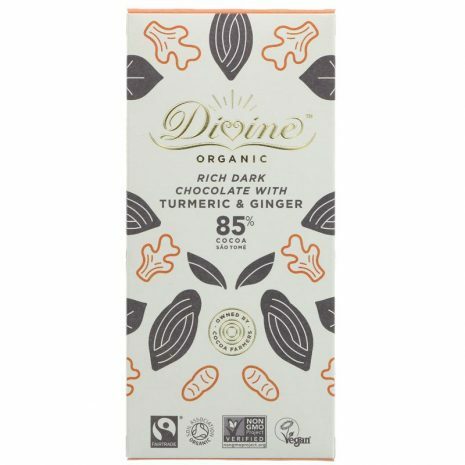 Enjoy this eclectic mix of delectable dark chocolate and tasty spice with this mouth-watering chocolate bar from Divine. The cocoa content gives this bar a rich 85% chocolate taste – a must-try for any fans of dark chocolate. Among the dark chocolate is a sprinkling of turmeric and ginger to give this bar an incredible sharp taste. Every bar is made in Germany and uses organic ingredients from fair trade sources. Divine supports sustainability in both labour and in farming practices, which is why every organic treat they make holds the official FairTrade label.